Green came to be thanks to vegan chef Damon Brasch and his 10-year long dream to open a vegan restaurant. He wanted to create a vegan restaurant where anyone could enjoy the food, not just the veg crowd. The fare is what Brasch likes to call “New American Vegetarian”, which is mostly American comfort food, made vegan. You’ll also find a wide array of cuisines and cultural influences on the menu. From what I read, it’s one of the Phoenix area’s most raved about vegan restaurants with locations in Tempe and Phoenix. We tried out the Tempe location as we were already in the area that day. Upon entering the restaurant on Saturday at 12:30, it was packed to the brim. There might have been one free table in the entire place, which was large, especially for a vegan restaurant. Green has a very casual, almost cafeteria-like setting, and is a nice spot for quick lunch or casual dinner. When we walked in, there wasn’t anyone to seat us so we stood there a bit awkwardly until realizing that you have to walk up to the cash to place your order before finding your own table. Noted! We were handed two huge double-sided menus and I quickly scanned it, trying to take it all in. I was cursing myself for not looking up the menu online. Am I the only one who loves to do that? When I go to a new vegan restaurant, I like to take my time to look over the menu and consider all my options (I’m not used to having so many), so I felt a bit rushed while standing at the counter with a line of hungry people behind us. Sometimes a good menu is like sitting down with a good book; it’s not to be rushed through and skimmed over with haste. My advice is to go in with a plan or risk a menu meltdown. I kept my composure though, well, mostly. bahah. After placing our order, they gave us a number and we went to find a table, finally deciding to sit outside since it was such a warm, sunny day. Just minutes after sitting down, we were brought our appetizers. That was quick! 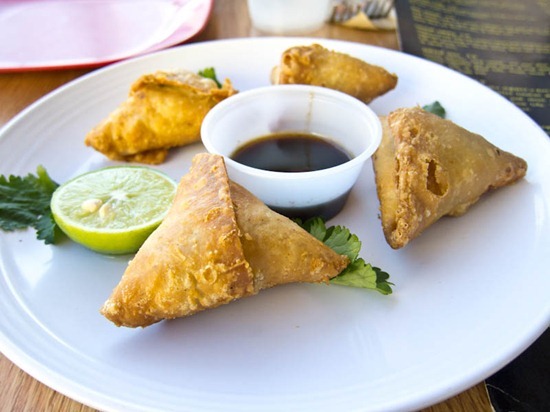 I ordered the Samosas with curried potatoes, peas, carrots, and fresh garlic wrapped in a thin fried samosa with tamarind dipping sauce. Excellent! Crispy with a soft doughy interior. I would have loved to see them spicier though. I couldn’t really taste the curry flavour coming through. I had two and Eric had the other two. Eric ordered the vegan chili fries which were very tasty and filling. It was large enough to serve 3-4 people easily. Just as we started our appetizers, the server brought out our entrées. Having the apps and entrées served at the same time is a bit of a restaurant pet peeve of mine. I like enough time to enjoy the appetizer without the entrées coming too quickly, otherwise it feels rushed and the apps often go to waste once the entrées arrive. I guess they must have been trying to go through people pretty quickly on this busy Saturday. If you want to linger over your meal, I suggest mentioning it to the server before ordering just so they have a heads up. Or maybe it was just a fluke, who knows! For my entrée, I ordered the Singapore Tofu made up of spicy curried house tofu tossed in a spicy orange glaze over thin rice noodles with fresh vegetables. Absolutely, to die for. The orange glaze was flavoured to perfection and it was impossible to slow down, despite my stomach telling me it was getting full. The tofu reminded me of a childhood favourite: sweet and sour chicken balls. I used to be obsessed with them growing up. I can only imagine how good it would taste if this glazed tofu was also battered and fried. I think I would pass out from all the excitement. The only thing I would change is to crisp up the tofu as it was very soft. I’m sure with a nice pan fry or bake, it would be nice and crisp. Yet another “must make at home” inspired meal! I finished all of the tofu and veggies and half of the noodles before claiming that I’d have to roll back to the car if I ate another bite. I’m one of those people who has to physically move the food away from my reach or I will just pick at it until it’s gone. 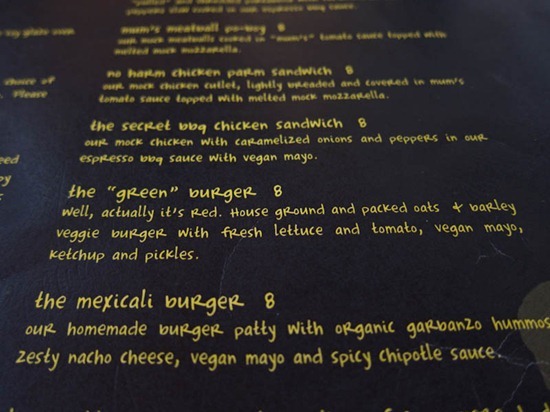 Eric ordered the Green Burger made up of ground oats, barley, and other unmentioned ingredients. I assume there must have been TVP or seitan in this as well, but I’m not sure. He loved the burger and said it had an authentic taste and texture. At this point I was stuffed, but Eric had dessert on the mind. I told him earlier that you guys raved about Green’s “tSoynami’s” and he said that we couldn’t leave without ordering one. What an enabler! 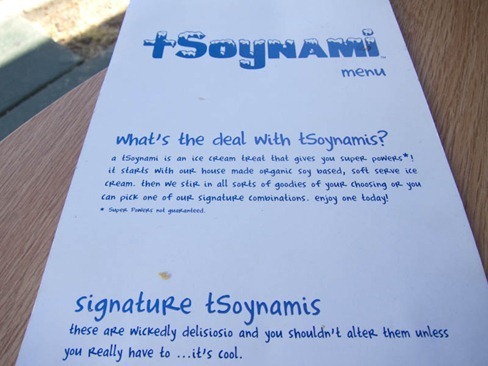 You can imagine my delight when I discovered that tSoynami’s are basically vegan “blizzards” made with homemade soy ice cream and a wonderful array of crazy toppings and flavours. You know how much I love my Chocolate Chip Cookie Dough Blizzard. There must have been over 25 flavours to select from. We also found out later that they had daily flavours in addition to the menu regulars. Cap’n Crunch flavour, anyone? I tried to get him to order the Ts’more, but sadly he wasn’t down with ricemellow fluff! Is it good? I’ve never had it before. 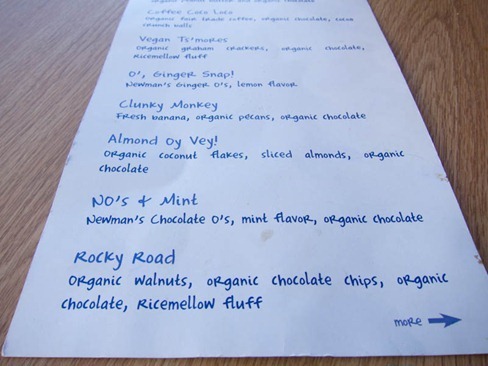 After much debate, he ordered the No’s & Mint made with Newman’s Chocolate O’s, mint flavour, and organic chocolate. Just what this hot summer winter day called for. 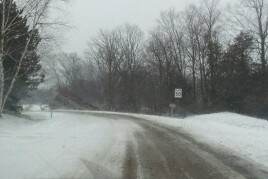 It’s crazy to think that it was about 24C and sunny on this late January day. Look at Eric waiting so patiently for me to take the picture already. Torture! While I’m not a huge fan of soy-based ice creams, I thought this was pretty good. I think it would be even better with homemade coconut ice cream or even banana soft serve though. The best part was digging into the cup searching for the huge chunks of cookie. Nothing beats that. Green is certainly a fun twist on traditional comfort food with many options no matter what you’re craving. While they have a large amount of soy-based processed foods on the menu, I would guess that they can accommodate soy-free requests, or at least I’d hope so. The prices are also reasonable and the portions generous. Hopefully we’ll be back someday because there are many things I still want to try! 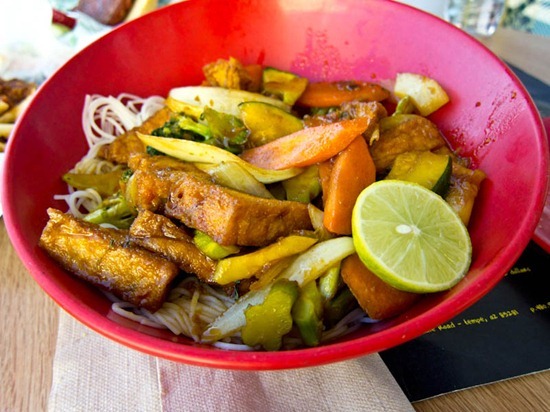 Do you have a favourite vegan meal from a restaurant? What is it and where is it from? What is your favourite vegan restaurant? Out of the vegan restaurants that I’ve been to, Candle 79 (NYC) is probably my favourite so far, with Fresh (Toronto), Karyn’s on Green (Chicago), Calactus Café (Moncton), Thrive (Waterloo), Sublime (Fort Lauderdale), Café Blossom (NYC), and The Coup (Calgary) ranking up there pretty high, although there are still many I haven’t tried yet, including the famous Millennium Restaurant in San Fran. Wow, I love the way they’ve written their menu! I enjoy places that obviously have fun with their food and their clientele. My favorite vegan restaurant – Gorilla Foods in Vancouver! I used to go to Vancouver from Calgary every other week to visit friends and that was our favorite place to eat. At the time, it was just a food stand squished between two buildings, but now it’s a full restaurant. If you’re ever in Vancouver, you have to check it out! Choices (as you know) in Calgary are pretty limited… so, the coup it is! They’re great… I would just love a few other choices. Gratitude Cafe in Kensington is pretty good. 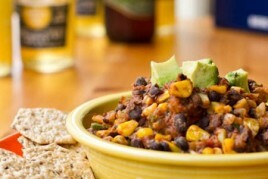 There’s an amazing restaurant in San Antonio, Texas called Green, http://greenvegetarian.com/. It’s technically vegetarian but they have vegan options including replacing cheese with daiya cheese (my first taste of daiya). They also have delicious vegan cupcakes! To die for! It’s definitely my favorite thus far. The Singapore Tofu is my fovorite too! I actaully crave it at times. The Phoenix location has their bakery next door…their vegan cupcakes are AMAZING! I forgot someone mentioned that! I LOVE Calactus Cafe!! It’s the only veggie restaurant I’ve been to yet, but it’s pretty amazing! You’ve got to get to Vedge in Philadelphia at some point. I’ve been to Blossom and Candle 79 and personally think Vedge blows them out of the water. Also, that tsoynami looks incredible! Yay I’m so glad you went and enjoyed it! Their bowls are to de for- especially their diablo red with fresh tofu. Mmm… I’ve had the t’Smores tsoynami (along with pretty much every other tsoynami on the menu… Hah) and it is really really good! Their seasonal “Punkin Pie” was my favorite, though – the only tsoynami I’ve gotten more than once! Their banana cream pie is pretty spectacular, too. So glad you decided to check Green out and enjoyed it! mmm pumpkin pie sounds amazing! ooh that mint cookie blizzard thing looks amazing!! 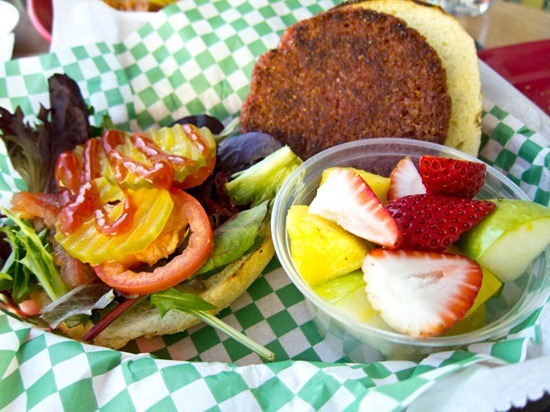 my favorite vegan restaurant was the green room cafe in Cocoa Beach, Florida!! I loved it!! I moved from Ontario to Vancouver in May and have tried Gorilla Foods, it was great! (It’s menu offers a lot of raw food). Unfortunately just after I moved is when they opened Thrive in Waterloo. I was a little disappointed in not getting to try it. However Vancouver is a great place to be a Vegan/Vegetarian! :-) – very accommodating. Angela, have you ever been to Vancouver? I’ve never been to BC at all, but it’s on our must visit list. I’ve heard so many great things about it. What a cool restaurant! I think I would have chosen the ‘green’ burger like your husband, looks so do good! PS. Naam is another great place in Vancouver you should try. Looks like a great place! We have ricemellow fluff around our place for my fiancee. I partake occasionally when I’m really in need of something sweet and gooey, but it’s a fry cry from real marshmallow fluff. It has kind of a dingy color and is more spongy than gooey. That being said, in a blizzard, I’d imagine you wouldn’t even notice that stuff. Good to know, thanks Katie! Looks like a neat restaurant! I think your singapore tofu and noodles look especially tasty. I share your pet peeve of bringing the entree too quickly. I also dislike it when a server snatches your plate away as soon as you’ve taken the last bite. There’s nothing wrong with lingering over a table for a few moments! Ahhh I am drooling!!! I want the BBQ chicken sandwich on the menu…or you know, anything you guys got! :-) Happy Friday! I love looking at menus before I go to the restaurant. I am the slowest person for picking out my meal, so I like to be prepared! That vegan restaurant looks absolutely fantastic! Haha, I am the same way when it comes to menus where I can eat more than just a couple of options. It is so much fun, and I like to take as much time as I want (which is loads) to look through each item and decide. Angela, first of all thank you so very much for your NYC posts. My husband and I are planning to spend our 10th Anniversary there this year, so can’t wait to check out the restaurants and sights you visited. Now for favorite vegan restaurants, my top one so far is a little place in Banff called, Nourish Bistro. Amazing and the plates are huge, so plan on sharing. Since we’ve been relocated to the Houston area, my “go to” vegan/raw stop is, Seasons’ Harvest Cafe. Their fresh daily menu is posted on Facebook and the owners are wonderful people. By the way, I’m a native New Brunswick girl who has also enjoyed the Calactus Café in Moncton. Hi Kathleen, I’m glad to hear that…I hope you have a nice celebration! Thanks for the tips about Nourish and Seasons…they both sound wonderful. I really wish there were more restaurants like this. For me, I have to drive at least 45 minutes to get to a decent vegan restaurant. There are many close by with vegan options, but I’d much go somewhere where every single thing on the menu is vegan so that I’m not tempted to order something with meat in it! I’m definitely not a fan of soy-based ice creams, but with all of those mix-ins, I bet they taste pretty good. Rice cream doesn’t do it for me either (except for the carrot cake flavor of Rice Dream..omg), but coconut ice cream is always good. I know what you mean, I’m at least a 40- 60 min drive to the restaurants around the Toronto area. I’d love to have one super close! What a lunch! That tofu looks great. Do you plan to recreate it? I have never heard of millenium and I’m from San Francisco!! Yum, I’ll have to try it. I have a few favorite vegan restaurants. When I was in LA, my favorite was Real Food Daily because it is perfect for vegans and non-vegans since they have things like Rueben sandwiches, BLTs, Nachos..yum! But, now that I live in DC, my favorite is Sticky Fingers Bakery! Vegan restaurant? What kind of lovely, magical creature is that? There are no vegetarian restaurants in my area, let alone vegan, although a couple Indian buffets have vegetarian days at least once a week. It would be so great to have a whole menu to choose from! I’m tired of reading online menus before making plans and putting the kibosh on that restaurant because the only vegan (usually veganizable) entree sounds like something I wouldn’t like, or the vegetarian entree’s main component is cheese. I am, however, enjoying my home cooking, especially since discovering your website. I’ve been making a lot of your cashew cream pasta sauce and cookie batter smoothie. My favorite vegan meal from an all-vegan restaurant is the what’s the dilly philly at ethos here in Orlando. It’s seitan and peppers on this to-die-for ciabatta with vegan mayo and vegan mozerella. Holy YUM! Yummy! I don’t know why you’d ever go there, but when I was in college in Columbia, Missouri, there is a restaurant called “Main Squeezed” with a lot of Vegan options, but it’s a Vegetarian restaurant. So yummy! Oh man, I could definitely get into this place! Those “burgers” all sound AMAZING. The restaurant looks amazing. All the plates look fabulous :D.
My sister actually booked a green restaurant for us to try when I visit NYC in March. It’s called Dirt Candy and since the venue is small, you have to reserve weeks in advance. I can’t wait to try their food since it was raved about on the Cooking Channel. ah, yea I heard about Dirt Candy when I was looking up places! It looks very mod and contemporary. Let me know how you like it! Wow, I wish there were more places like this over here in Scotland! It all looks amazing! 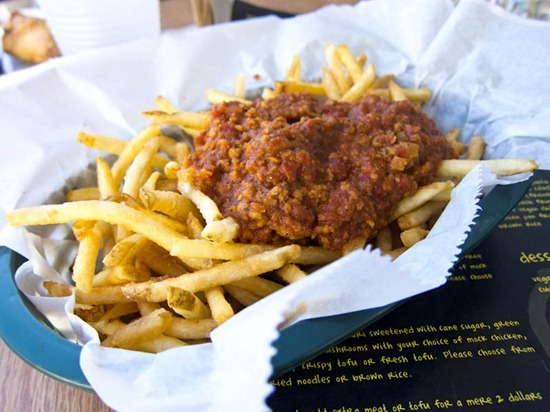 i kind of want a massive plate of those chili fries in front of me right now…yum! The menu looks incredible. I’d definitely be steering away from the soy-based items but I wish I could drop in! We live in Tempe and LOVE Green! Even our kids eat there with us. Right down the road from there to the south is Udupi Cafe who have an amazing lunch buffet, almost entirely vegan, all veggie. There is also Tsom in Tempe. It’s located on University and Rural in the back of a little strip mall. The best vegan finds are always tucked away almost hidden. Enjoy the rest of your stay in the Valley! good morning, Friday morning, to you Angela!!!!!!!!! I have not, yet eaten at a vegan restaurant…seriously, it’s been one of the “strangest” words to people in my peer group that is now just second nature to me: “vegan” … somehow it has this weird connotation in “my” society…eventually, though, I think others will realize that it is not only harmless and NOT offensive, yet it is one interpretation of a gentle lifestyle that is not necessarily so focused on just the food. 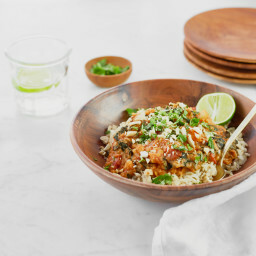 anywhoooo I am going to try a veg restaurant in a town near mine this weekend…south indian cuisine! (not vegan but they do have some of those dishes! also! i just posted “inside-out blondies” hehe! of course i was thinking of you when i was concocting in the kitchen! You had me at “vegan blizzard”. 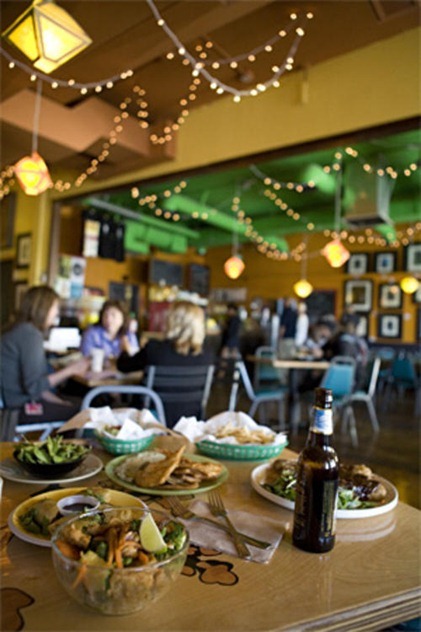 If you are ever in Kansas City, Eden Alley or Fud is a must – both delicious vegan eateries. But my favorite lunch spot used to be Tender Greens in Los Angeles. Their Happy Vegan salad and Daily Couscous is Uh-mazing!!! I do that with vegan menus too! Well, menu- I’ve only ever been to one vegan restaurant, but I do it with non-veg menus too, so I know if there’s anything I can order or if I need to create my own off menu thing. Anyway, I love your blog and I wish I had one of those mint chocolate things right now! I am the same way about ordering at a counter and feeling rushed… but I think I could get over it for a “Ts’more.” You guys have the best stuff! That sounds amazing…there is something to be said about a great comforting meal after being outside all day! In Chicago, my little gem of a place is called Victory’s Banner. The best brunch and lunch spot in the city. They have some vegan items on the main menu (which is all vegetarian) and another separate vegan only menu. As a Chicagoan, I can vouch for the Karyn’s on Green recommendation. Oh, and that tofu dish is reminding me how long it’s been since I’ve made Colleen Patrick-Goudreu’s similiar dish, orange-glazed tempeh, one of my favorites! That ice cream looks so good. My favorite vegan restaurant is Native Foods in southern CA. They have a great mix of healthy meals and guilty pleasures. Millenium is great- probably my favourite and in NYC there is a vegetarian-Korean restaurant and it is up there too! 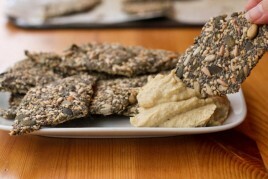 In Toronto, Live-Raw Food Bar, Fresh, urban herbivore and Fressen! I ALWAYS have trouble deciding what to eat at resturaunts and I hate being rushed. Resturaunt menu melt-downs have definitely occured to me before, haha. 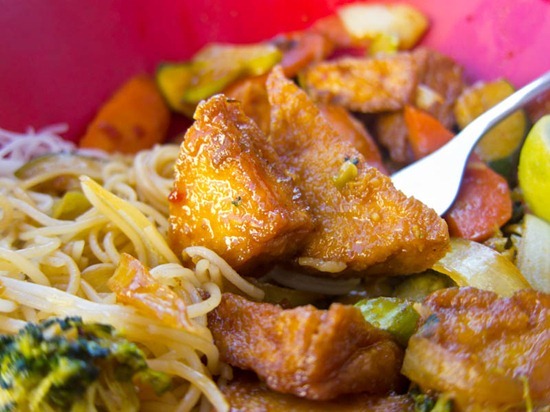 That orange-glazed tofu dish looks deeeelish, hope you can re-create it and share it with us! Sounds like a great meal! As you mentioned, Millenium is a must-try if you are in the San Fran area. I had NO idea we had a vegan restaurant in Waterloo!! I’m going ASAP! Green Elephant in Portland, Maine is a great vegetarian/vegan restaurant! Mmm…now I’m craving their wasabi brussels sprouts. Ahhh i could and WOULD get used to that place easily!! Ummm….Samosas?! Yes Please!! That looks so tasty! The hubbub and I have date night tonight and I wish that restaurant was here in Los Angeles. I love Native Foods and Real Food Daily is just ok. There are always lots of celebrities but everytime I go I get a tummy ache. By far, the best vegan place is in the San Fernando Valley called Madeline. It’s vegan fine dining but affordable with tasty comfort food. Another place in Phoenix that I didn’t go to for the 9 months I lived there. WHAT was I thinking?! That tofu with the orange glaze looks like it may be worth a trip to the restaurant, just for that. 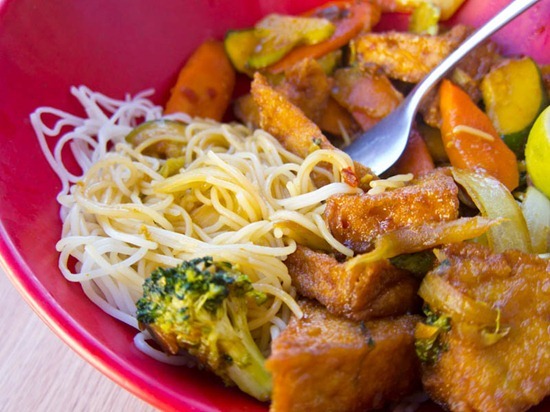 I adore orange-glazed, sticky-ish tofu like that…yum. And the burger, too. Oh I so wish my little part of this big world offered vegan restaurants, but alas it does not. We have your basic fast food restaurants, with a few family owned italian places, but ne’re a veggie option in sight. I can ala carte wherever I go, but it would be so nice to go into a place and have a nice wide selection to choose from. When I ask for vegetarian options, everything is covered in cheese and when I ask for vegan options, I get a blank stare and a “Wha?? ?” Would love to try Green. The selections look so yummy. i know the feeling!! i hate that people seem to think that vegetarian meals should be overloaded as if they need to compensate for the lack of meat or something.. my area is so limited too, getting the treat of going out for a vegan dinner where i have multiple options is the best thing ever!!! What a treat! Looks so unique and yummy. I take forever to decide what I want to order too – especially when there are so many delicious options like on that menu! I love the vegan restaurant Fressen in Toronto – have you been to it? I was so impressed that they were able to accommodate my nut allergies! I don’t remember, but did you get to go to Sfogo ice cream when you were in nyc? soooo good. We are spoiled with vegan restaurants here in Portland, Oregon, but I have to say my favorite is Portbello! So good! I’m going to San Francisco in March, and we are going to try Millennium. Can’t wait!!! Oh, those samosa look delightful! 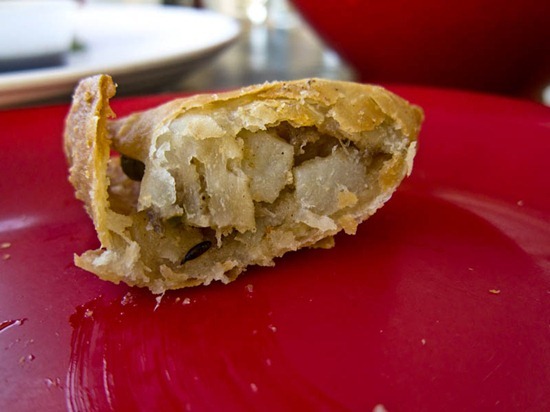 I am trying to perfect a GF, vegan samosa…there are a lot of duds but it is coming along. I know what you mean about the spices. I think that some people are scared of the spice because there are a lot of people that do not like spice but I grew up with friends who had their moms make homemade samosa, to die for!!! If you are ever in Vancouver, you need to try Eternal Abundance on Commercial or Gorilla Foods on Richards, they are both great vegan places that I know you will enjoy! Every time I am in Vancouver, those are the go-to places. Where I currently live with my Hubs is not vegan friendly so I am out of luck and make everything at home! That tsoynami looks amazing!! We used to have a vegan restaurant right across the street where I work but it closed down about a year ago. So sad! The fact that our small little town even had one to begin with was mind blowing. One of my fav vegan meals is the un-burger. I believe they used sunflower seeds on theirs. It was heavenly. Thank you, I had no idea I was nominated! That food all looks amazing! Glad to see you’re enjoying tofu so much. Thanks for the review! And for the shoutouts of other restaurants – my sister lives in Calgary and I’m going to visit her soon so will have to give The Coup a try! Ever tried any in Vancouver? Halfway between NYC and Philly is an eclectic little town called New Hope, PA. We have a great vegan restaurant called Sprig & Vine. I have been to Candle 79 and S&V is on the same level plus less expensive! They have an awesome Sunday brunch and delicious lunch and dinner menus. My favorite dinner was a buttercup squash ravioli with sage bread crumbs, with brussels sprouts, winter squash, and apples. Their menu is vegan, seasonal, and mostly local too! Here in Utah County there aren’t too many options for vegans. However, the couple that we do have are great! 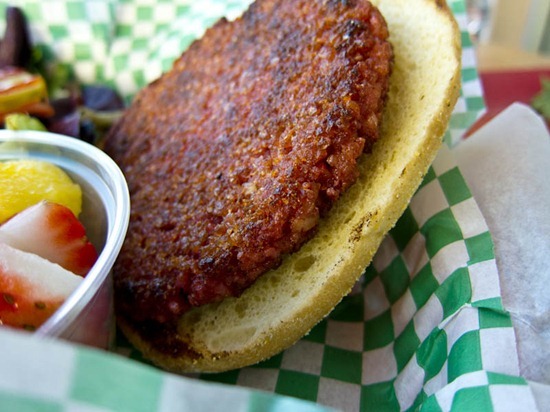 My favorite is probably the Falafel Sandwish from Ginger’s Garden Cafe or the Veggie Burrito from Guru’s. Omg Angela! Pleasseee re-create the orange glazed tofu soon I would love a recipe for that! It sounds amazing and I agree it would be heaven if it were crisp and fried, definetly stomach excitement passing out material haha!! Wow it all looks great. I would have been all of the S’mores one, shame you couldn’t try it eh damn Eric :P baha! Much love, sweetheart. Hope you’re well. This place looks amazing! I wish there were more yummy and healthy places around Toronto. Speaking of that, friends of mine from Foodbuzz 2011 kept telling me to message you to get invited to blogging events in Toronto that you throw (and apparently my scatterbrain just got around to it today – for shame). Anyway, I’d love to meet up at some point! Your blog is so beautiful and inspirational (especially to people who have struggled with eating disorders and canadian food bloggers – I’m right in the middle of that venn diagram). There is actually a meet up in the next month or so (it’s me organizing it though), I will shoot you the info via email! I always order the singapore tofu too! Except I always have them sub the noodles for brown rice. I’ve tried ALMOST everything on their menu and the Singapore tofu is still my favorite! Mmmm! I miss “blizzards” a lot since going dairy-free several years back…hopefully I can get more in to different homemade ice cream options this summer, and you’re right, banana soft serve is always a yummy alternative! My husband and I ate at Millenium in SF with some friends last year before seeing Wicked. The food was fantastic and the atmosphere cozy and fun! Hope you can make it this way one day to try it! Fresh is my fav in Toronto, although I haven’t been to all of them. I love Karyn’s on Green in Chicago! Although, the best place for vegan comfort food in Chicago has to be the Chicago Diner. The have an amazing vegan reuban as well as great dessert! Cafe Gratitude in San Francisco is my favorite… by far. haha…just realized how repetitive my sentences look. This is why I usually edit everything! I haven’t tried soy ice cream (ice soy? ), but that No’s & Mint looks fantastic! My favorite thing to do is to peruse the menu online. I almost never go anywhere without doing that first, because it’s realllly hard to find gluten-free AND meat-free/dairy-free options at a restaurant. There are quite a few places that are getting hip to the gluten-free thing, but then it’s all about meat. Or I’ll find a ton of veggie options that are just full of gluten. Such a bummer! Greens looks like a great restaurant! I totally have trouble with all vegan menus, or even places with more than one or two options. It makes me sad that I can’t try everything. The top two vegan restaurants I have eaten at are Millennium (of course you must go if you’re ever in the area) and Raven’s Restaurant in Mendocino. If you are ever in Seattle you must visit Plum Bistro. The Mac n Yease is to die for, honestly, my husband (who is not vegan yet) said it’s the best Mac n Cheese he’s ever had. I love their burgers and the cocktails are great too. Also very good is Cafe Flora. They are veggie with lots of vegan options. Great brunch spot. I’m lucky to have so many spots to eat my vegan heart out in Seattle. If you ever have the chance to try ricemellow you should! It is great! Oh wow, I wish we had a restaurant like this near where I live. I would probably eat there every single day. Your tofu dish looks absolutely yummy. I can’t wait to see your recipe for the re-creation. I’m sure it’ll probably be ten times better than their’s. I used to always order the sweet and sour chicken from our local Chinese food take-out place back in the day. That stuff was freaking awesome (or at least that’s what I thought back then). Thank goodness I’ve wised up and stopped eating crap like that anymore. Yay for tofu! Real Food Daily has long been one of my favorites, but tonight I am going to try Native Foods Cafe in Culver City for the first time. It’s supposed to be terrific so I am very excited! What an awesome restaurant! The food looks amazing! I would want to try the singapre tofu! Though not strictly vegan (only veg) Fresh in Toronto holds a special place in my heart. I really miss living down the street from one! I know exactly what you mean about being overwhelmed when at a veg restaurant! It is so hard to choose when you can eat every. single. thing on the menu! I’ve bee following your blog for a while but haven’t left a comment yet! I think you’re fabulous, and I love all the recipes that I’ve tried so far. I’m actually from Calgary, and I just recently moved to Toronto for school and I would have to say hands down that The Coup is the best vegetarian/vegan restaurant I’ve been to. I’ve been to Fresh and Live, but are there any other good places to check out in Toronto that even come close to the Coup? Hey Charlie! I’ve also heard that http://www.commensal.ca/index.html is very good, although it’s buffet style I think. I haven’t been to it yet! Yes, PLEASE recreate that tofu dish because it looks soooo good. I would love to try some crispy orange flavoured tofu. If there’s one thing I love, it’s crispy tofu (I basically burn mine in the frying pan haha). I think I’m the enabler in the relationship. But chances are the odd time I don’t want dessert, my husband does and then of course I cave haha! My fave restaurant is Dharma’s in Santa Cruz/Capitola! Huge portions of delicious food and very casual. If you ever visit NorCal try to make a stop here because Santa Cruz is a great place to visit what with the Santa Cruz Beach Boardwalk and great hikes in the redwood forests nearby. Oh and there’s a cute eco-friendly B&B to stay at in Santa Cruz right near town called Adobe on Green if you ever make a trip. I still have yet to venture out to the vegan restaurant everyone in Denver says is to die for: Watercourse foods. Maybe this weekend! On another note, I might have missed it, but have you ever made Samosas? I love them when I go out, but am intimidated to make at home. Even though I’m not a vegan or even vegetarian, I always appreciate this type of restaurant. I think there’s a bigger emphasis on fresh produce and veggies always make me happy! 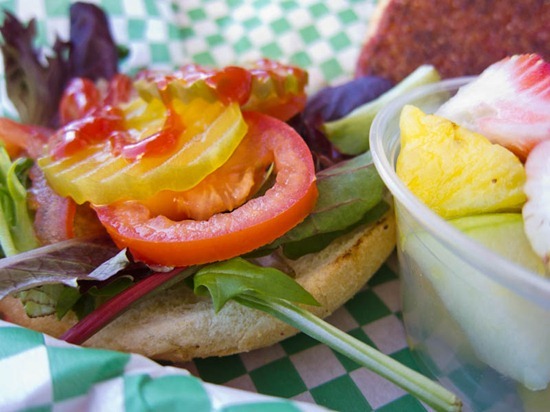 Here in Oregon, we’re lucky to have quite a few vegan and vegetarian restaurants. When I lived on Maui there was a vegetarian Vietnamese restaurant that had the best summer rolls. Ummmm… I would like one of those right now! At Comet Cafe vegan meatloaf with beer-braised brussel sprouts and mashed potatoes with vegan gravy is absolutely to die for! It’s all I’ve had there as far as dinner goes.. I’m excited to try the vegan gyros and their Leghorn sandwich. The leghorn is a chicken substitute(I would assume a seitan combination), vegan cream cheese, cucumbers, apricot jam, lettuce, tomatoes, and onions on a whole wheat bun. Plus they have some big, delicious vegan cupcakes! You HAVE to go try Millennium in San Fran!! It’s absolutely tasty. While you’re there visiting, which I assume you’ll have a few weeks to try all of the amazing eats, I suggest that you try Gracias Madre in the Mission. All the food is organic, from there own garden and change seasonally. 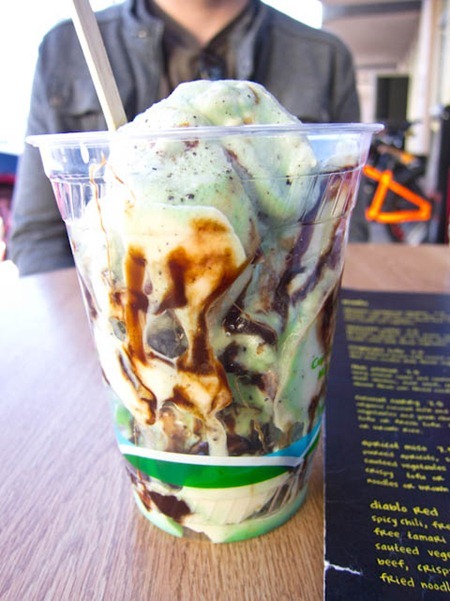 For dessert, cross over the bridge into Berkeley and try Cinnaholic. Seriously, I’ve never put anything so delicious in my mouth. My favourite vegan restaurant is a little place around the corner from my office called Merit Vegetarian. It’s about an hour south of San Francisco. And in my opinion, Millennium is over rated, so save your money and head to Merit if you are ever out this way. I wish we had restaurants like this near me! Everything looks great and the fries, super yum!! It sounds like a fantastic restaurant (the chef’s write up literally made me shiver). I totally agree about crispy tofu. I love Pure Food & Wine in nyc, but not for everyday grub. I’d say Caravan of Dreams in nyc. Has a great, warm and dim-lit atmosphere and a great menu. The menu sounds so good and the food looks so yummy! Wish there was a location closer to Vancouver. This place sound wonderful! Your so luck to have all these great vegan friendly places near you. There are several places here in Austin, Texas that are pretty tasty. If you ever make it down this way, you definitely need to try Mother’s Cafe (vegetarian), Counter Culture (vegan), and Sweet Ritual – a vegan ice cream parlour that recently opened. Oh my gosh, Calactus is my all-time favorite restaurant. I’m from Moncton, and miss my regular eatery since I’ve moved to Ont. Time to find a replacement! We have a new vegan restaurant in Asheville NC and it is amazing! It is called Plant. I lived in LA before and have eaten at several vegan places but Plant is really fantastic!! I’ve only been to one all-vegan restaurant and it was on a vacation to Mendocino, CA. It is a very well known restaurant called Ravens. I’m sure many people have heard about it. Beautiful food in a picturesque setting. The resort it is at is eco-friendly and they grow their food on site. I’d love to have more vegan restaurants in my area ( I live outside Sacramento, CA). If anyone knows of any, shoot them my way! Angela, I’m dying to have that tSoynami…I would have gone for the Ts’more too. The Newman Os one looked good too! Did you know they have mint Newman O’s? Green is one of my favs! I work just a couple of miles away and it is a great place to get out of the office and have a satisfying meal. I have taken my boss there a couple of times and she is also a fan even though she is not a vegetarian. Even my husband enjoys it! :) I can also recommend Spiral Cafe in Ft. Worth, TX. I was in the area on business and found them and they too are amazing, such great food and baked goods. Glad to know you’ve found a little valley treasure in AZ. Take care! 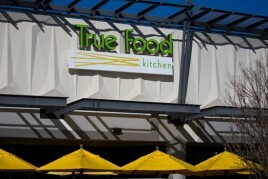 I’ve never been to a truly vegan restaurant before, but I would love to try Thrive in Waterloo! Yay, that is so exciting you were able to try Green. I don’t know if I’ve had the singapore tofu, I’ll have to try that next time. Eric’s Tsoynami looks pretty good too, funny I got the PB N Chocolate one yesterday after a long hike. I’m glad you enjoyed AZ! Angela, you have made my day AGAIN!! (As always.) Of course it is the deliciousness of your graham crackers that makes this amazing–but I hope you’ll give me some creativity points ;-) Vegan Lunch Box has a recipe for homemade PB&J Pop Tarts made with pie crust. I always thought it was such a cute idea, and perfect for a portable breakfast. Never got around to making it. (Story of my life :-P) Then I made your graham crackers. And then the heavens opened, and the inspiration came: PBJ Graham Squares!! And then, because I have Dandies marshmallows and Justin’s Chocolate Almond Butter on hand, I clearly had to make a s’mores square, as well, and it was SO GOOD. I made a QUADRUPLE recipe of graham crackers this time!! I’m going to have the BEST breakfasts this week!! I’ve never been to a vegan restaurant because we don’t have any around us. Everything looks amazing! I ALWAYS creep on the websites and menus of places before I go! I usually know what I’m getting before I even step in the restaurant hehe. I also hate when they bring the entrees right after the apps, so annoying! Ooo this place sounds wonderful! My favorite vegan restaurant, so far, is the Loving Hut in Seattle. Even my meat-loving boyfriend loved the food!! That looks amazing!!! !One of my favorite dishes is the hunan bean curd, which your dish totaly reminds me of it. It is soo delcious.YUM! I’m headed to Toronto shortly and noticed you recommended Fresh. Looks tasty! Any other vegetarian and gluten free restaurant suggestions? I’ve heard http://www.commensal.ca/ is good! I’m so glad you went to Green! My best friend lives in Tempe and it’s a must every time I visit her. My FAVORITE vegan restaurant is Cafe Gratitude in Los Angeles. There are other locations among CA too. I’ve tried about half the menu items and have never been disappointed. Everything is to die for! And they are not heavy on the soy products like a lot of places. My runners up are Watercourse Foods in Denver (vegetarian with lots of vegan options) and Sun Cafe in Los Angeles (raw vegan cafe). MMMMMMM! I just ate but I’m getting hungry just thinking about them!! While in Vegas we discovered that the restaurants at The Wynn all have both Vegan and Vegetarian menus. We dined at Bartolotta and ordered from the Vegan menu. The food was absolutely delicious. Perfect pasta dishes. Great service. If you liked the Singapore Tofu, I’m sure you’ll love Spicy Thai sauce. It’s very similar and not very spicy but I’m sure you can add orange to it. You could even make it at home too! 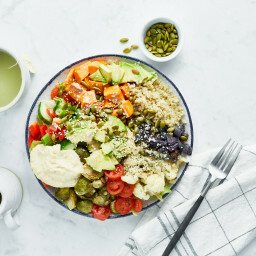 Hey Izabela, I’m not sure if there are any vegan friendly joints around Niagara region, however I would suggest trying out Happy Cow: http://www.happycow.net/ goodluck! I have two favorites…. Number One – Café Gratitude in LA, love the atmosphere and philosophy, great folks…. Number Two – Beets Café in Austin, TX – the ELT, curry carrot soup, zucchini hummus or just a few of my many favorites and their desserts are unbelievable! Mmmm green is my FAV!! I moved to phx during my veg transition and was so excited to find green. Utah didn’t really have many veggie friendly restaurants, especially not near where I lived. My favs are the no harm chicken park, Argentine, and bbbq burger. To die for!! !